This pack is supplied with a specially modified DigiSender transmitter & receiver fitted with an external SMA antenna connection. Using the supplied 24dB parabolic dish connected to the DigiSender receiver, incredible ranges can be achieved. The pack also contains 12.5 metres of high frequency/low loss cable pre-fitted with the required SMA and N-Type connectors. This means no cable construction need be done and the system can be constructed & installed in under an hour. The parabolic dish is suitable for mounting externally and can withstand the harshest environmental conditions. Please note that quoted ranges may vary according to local site conditions and you should always conduct a site survey prior to installation. This antennae can be connected directly to our DigiSender Long Range (DG300) receiver to create an audio/video link with a staggering range. Installers please note: All quoted ranges will vary from site to site. Never guarantee specific ranges without a full site survey. 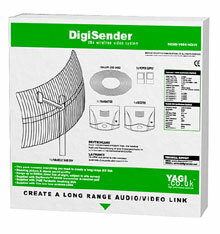 DigiSender 1000m Audio/Video Link This pack contains all you need to create a wireless audio/video link with a range of up to 1000m. This pack is supplied with a specially modified DigiSender transmitter & receiver fitted with an external SMA antenna connection. 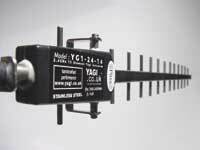 Using the supplied 14dB Yagi antenna connected to the DigiSender receiver, incredible ranges can be achieved. 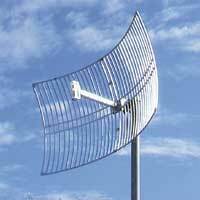 The Yagi antenna is suitable for mounting externally and can withstand the harshest environmental conditions. Please note that quoted ranges may vary according to local site conditions and you should always conduct a site survey prior to installation. Unique to the DigiSender Long Range is the external SMA antenna connection. This enables to to connect one of our high gain antennae to create a long range a/v link. The optional antennae come pre-wired with 12.5 metres of low loss cable so they are ready to go with the minimum amount of fuss. When used with the YG2414CB12 a range of up to 1km can be achieved, or 5km with the YG2425CB12. You can use as many receivers as are required to receive pictures and sound from up to 4 corresponding DigiSender transmitters. To extend the range of this receiver beyond 100m you will need to add one of the accessory antennas, YG2425CB12 or YG2414CB12. Please note: remote control extender technology is not included in the long range DigiSender models. 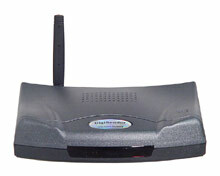 By using our long range receiver with an external antenna you can view the signal from this transmitter up to 5km away.